Whatever it was that Rudy Giuliani was supposed to accomplish for Donald Trump when he joined his legal defense team, Rudy has utterly failed to achieve it. The Democrats are taking over the House, Special Counsel Robert Mueller is about to make his big endgame moves against Trump, and all Rudy can do at this point is, well, malfunction – so that’s precisely what he’s doing. Here’s what Rudy Giuliani tweeted just hours before power was set to shift in the House, complete with a misspelling of Robert Mueller’s name, and his usual ongoing troubles with using his space bar: “According to CNN witches favor Democrats and they are offended that the Meuller investigation is described as a Witch Hunt. There is no reason for the witches to be offended because Witch Hunt derives from,for example,the Salem Witch Hunts where people were executed unjustly.” Huh? Did Rudy’s brain just implode? This is so bizarre, even by his standards, we had to double check to make sure it wasn’t some kind of Giuliani parody account. First of all, it’s Donald Trump who has repeatedly used the phrase “witch hunt” – yet Rudy seems to think that the phrase is being pushed by the other side. And if modern day witches are offended by the term, it’s partly because the Salem witch trials were such a travesty. But then again, it’s not as if Rudy even knows what he’s babbling about. Rudy Giuliani’s legal representation of Donald Trump began with the bold proclamation that he could somehow magically bring the Trump-Russia investigation to an end within two weeks. 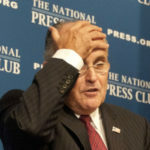 Now that the House Democrats are about to be in position to help make sure Robert Mueller is able to finish what he started and bring Trump to justice, Rudy is going out with an incoherent whimper that raises questions about his current relationship with leftover eggnog.